In the month of August, 10 infants and 4 women were enrolled in our programs. Of the 10 babies, 5 were orphans, the mother of 1 was critically ill in the ICU, the mother of another prematurely stopped producing breast milk, and the remaining 3 were underweight. Nurses visited 144 babies this month and are currently following a total of 245 babies. Seventy-five babies are on formula and 230 tins were distributed. Of the women admitted, one had eclampsia, two had severe infections, and one experienced a ruptured uterus. Twenty-three home visits were made this month to sick women. Baby care story: Jean was 19years old and having her first baby. On July 15th she began to bleed spontaneously. Luckily she made it to the hospital in time for an emergency C-section. Her baby boy cried as he was lifted from her body; he was a strong healthy baby weighing 5.5lbs. Soon after the surgery, mother and baby were deemed stable and transferred to the postpartum ward where they would remain for the next several days. On July 18th Jean complained of heart palpitations. In the capital city, in the district hospital, in the ward, Jean died before a nurse responded to her complaint. Jean’s death tragically illustrates the inadequacy of the health care system. She may have died from an infection or from internal bleeding or something else. No one will ever know why she died at 19. Her son will never again feel her warmth, taste her milk, or hear her voice. Nurses directed her relative to the office of Joyful Motherhood, located on the same campus as the hospital, and they were admitted to our program. Mother care story: On 21st August, 2018 Juliet started convulsing. Staff at the rural hospital where she was, started her on medication to try to stop her seizures then transferred her to the referral hospital in the capital city. When she arrived her baby was delivered by C-section. The baby took his first breaths but did not cry. On August 26th her baby died. On August 28th, Juliet was discharged home to her village. Each of the remaining 12 admissions for the month of August has an equally heart-rending story. For many, these stories include the death of a baby or a mother. These tragedies indelibly mark the lives of family members left behind. However, they (the sister or mother of the woman who gave birth) make a conscious decision to continue forward and care of the vulnerable survivor. They do this at great personal cost. And, thanks to you, those who find their way to Joyful Motherhood are granted the necessary support to multiply their efforts. Sacrifice + support = hope…. and later joy. Six month old twins Nkanzo and Pemphero are healthy beneficiaries of Joyful Motherhood. Years before their birth, their Malawian parents moved across the border to Mozambique in search of a better life. They settled there and had five children together. These twins were their sixth and seventh children. 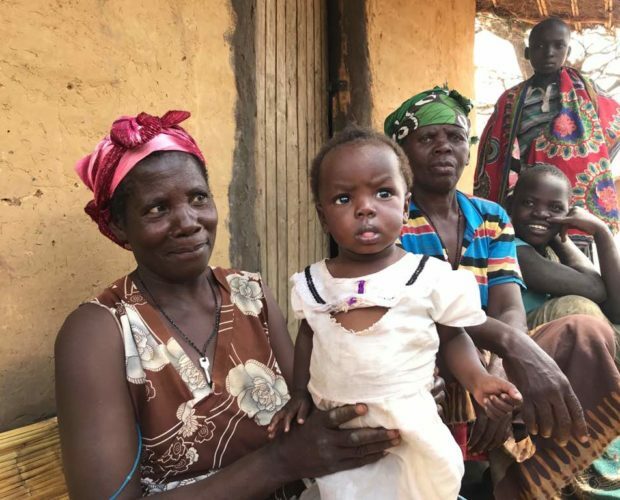 Their land provided what they need to sustain their large family but it was located in a remote area, a long journey to the nearest health center. In spite of the distance, their mother made it to the clinic for prenatal care four times during her pregnancy (this is the recommended number of prenatal visits in Malawi). However, when her labor started there was no question that she would labor at home. Without transportation many women deliver their babies at home in rural areas. Given the circumstances, this is a rational decision, and most of the time births are relatively uneventful. Nkanzo and Pemphero each cried spontaneously after being pushed into the world, but within moments their mother began to bleed profusely. The women with her alerted other community members who quickly loaded her in an ox cart to take her to the clinic. But long before their destination sat on the horizon, she died. 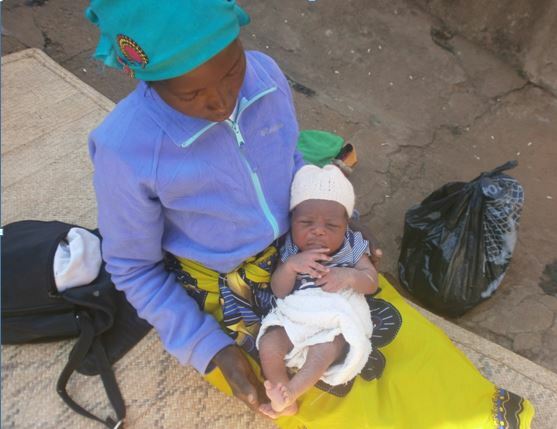 Rather than returning, the group continued to the woman’s home village in Malawi with her body and her babies. The remainder of the journey was marked by the slow plodding of the ox, a woman’s weeping, and the occasional cries of hungry newborns. Upon reaching the home village, maternal relatives immediately assumed care of the babies and tried to provide for them as best as possible. Without breast milk or formula the babies quickly began to deteriorate. Guardians took the babies to a clinic for treatment and from there they were connected with Joyful Motherhood. The JM nurses recount that they were not optimistic about the survival of the tiny sick babies. Still, they provided medication, formula, and education. And, after several weeks they returned to find the babies improved. Joyful Motherhood has been following the twins over the past several months. At this point the twins are bright and curious little babies who bring joy to those around them. This is another example of the difference we are making together in Malawi. When her daughter married and moved to a village some distance from her own, Ana Andrew’s grandmother said goodbye with a mixture of joy and sorrow. Neither owned a phone and so time passed without any communication. After almost a year someone from her son-in-law’s family came to tell Ana’s grandmother that her daughter had died shortly after delivering a premature baby girl. She was told that her daughter died from asthma. The story was vague. Apparently the young woman had become ill and went to the hospital where she delivered and died. Lingering unanswered questions regarding untimely deaths are often the norm in Malawi. Irrespective of the story, Ana’s grandmother knew the tragedy and horror would remain unchanged. She collected her 2lb 10oz granddaughter, looked in her bright and hungry eyes and decided that she would be the focus. She brought Ana to Bwaila Maternity Hospital where they were admitted to the kangaroo ward. Kangaroo care has shown to improve survival for premature and low birth weight babies in low resource settings. It involves tying the baby skin to skin between the breasts of the mother or guardian and keeping them in this position day and night, except when feeding, bathing or changing. Women stay in the ward while nurses teach and supervise the condition of their babies. Ana was discharged home weighing 3lbs 3oz. At this point nurses from Joyful Motherhood stepped in and began their regular visits – building a relationship with Ana’s grandmother and extended family. assessing Ana, providing formula, and later porridge. Ana is now 1 year old. She is not yet walking, but she speaks clearly, calling people by name and asking for food when she’s hungry. Brightwell was born just across the border in Mozambique. His mother died silently at home moments after his birth. Understanding the fragility of the life in their hands, her relatives brought Brightwell to the closest hospital that very day. The hospital happened to be a small community hospital in Malawi, where on admission he weighed 4lbs 3oz. His maternal aunt stayed with him in the hospital for several weeks, an act demonstrating enormous love and self-sacrifice. In Malawi when anyone is hospitalized they must be accompanied by a guardian – usually a female relative – who will feed them, bathe them, wash their clothes, and advocate for them. Because there are so few nurses in the hospitals, these tasks fall to relatives. This in turn, places a significant strain on most families since this person must leave their own responsibilities back home unattended for an indefinite period (i.e. the care of their own children, the care of their fields). And, if they have come from a significant distance, they must now pay for food, firewood and sometimes medicine to care for their patient. Families may sell their own food for the coming months in order to have cash on hand for such a stay. Brightwell’s aunt did all of this without question, knowing that the baby faced certain death in the village without a mother. She hoped that the hospital would provide the needed support and they would eventually return home together. Unfortunately over those weeks, Brightwell lost weight. Day after day he continued to deteriorate, but unaware of a better option and still placing her hope in the health care system, his aunt stayed on. One day a woman visiting the hospital from another village in the area saw Brightwell and his aunt and asked about their story. His aunt told the woman about her sister’s death and her need for support for the baby. This woman making the inquiry came from a village where Joyful Motherhood had previously supported the care of an orphan and she immediately told the aunt about us. The aunt packed their belongings, tied Brightwell to her back and boarded a minibus to Bwaila Hospital, about an hour’s drive away. 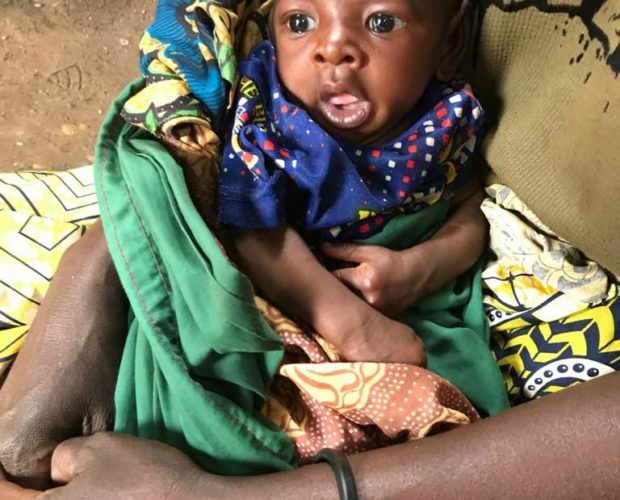 When they reached Bwaila they found the office of Joyful Motherhood and within minutes someone was preparing formula while a nurse began the intake and assessment. Brightwell was severely emaciated that day, his weight was just above 3lbs, his eyes were deeply recessed in his skull and his breathing was shallow. His situation was dire but finally there was hope. The nurses instructed his aunt on how to prepare formula, taught her when and how to feed him, told her how to prevent illness, and what danger signs to look for. Finally based on her instructions they drew a map to Brightwell’s home. Within a few days nurses were in the village for their first visit. They met with the chief and the extended family, they watched the aunt prepare formula, asked about feedings, health, and looked for a bed net. They provided additional education and formula. Once they felt satisfied, they said their goodbyes and promised to return again in a couple weeks. This picture is from the second visit by Joyful Motherhood nurses. Although Brightwell is still small for two months, his health has improved dramatically and he now weighs just over 7lbs. 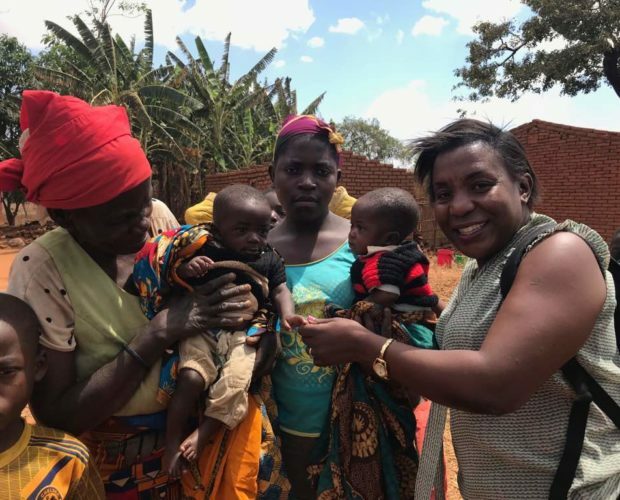 This story perfectly illustrates the precarious line between life and death in Malawi, the lack of resources even within the health care sector, and the important role that Joyful Motherhood plays in creating a net beneath existing gaps. This story involves one tragedy but without JM it may have included several others. Without JM, Brightwell would have died within a short period of time, and his aunt’s family (including her mother, her children and the orphaned children of her sister) may have faced more significant hunger due to the financial strain on their extended family and the absence of the two adults in their prime. It is hard to read these stories, but it is inspiring to recognize the extent of sacrifice and love individuals make in order to care for the most vulnerable members of their communities. And, it should give you great pride knowing that the support you offer is enough to turn these stories around and transform lives. Thank you. Takonda is pictured here with Nitta’s (one of our nurses). Takonda’s mother bled to death just after delivering her, leaving Takonda and two other young children motherless. Takonda and her two year old brother now live with their maternal aunt. Currently, Takonda is thriving in her aunt’s care with the support from our nurses, and the donated formula. However, the family lives in desperate poverty and the addition of one small belly to feed is more than they can manage. Takonda’s brother has deteriorated significantly since his mother’s death and our nurses are seeking additional support for him. In Malawi, a mother’s death puts the lives of all her children at risk. We need your support to help him. 17 Babies were admitted in July. The mothers of 13 of these babies died just after their births. The mothers of 4 of these babies are not producing any milk, including 1 set of premature twins. 70 of the 248 babies currently in our care are receiving formula, 250 tins of formula were distributed. Anna went into labor with her 4th baby on June 22nd. After a long day of painful contractions and no progress, she delivered a 9lb4oz baby boy by c-section. Mom and baby seemed healthy and were discharged home four days later. On June 26th Anna complained of a headache and started seizing. She quickly deteriorated and died at home on the same day. Baby Lyson and his aunt (pictured above) were referred to Joyful Motherhood to receive assistance. 22 year old Oliveta was well throughout her first pregnancy. 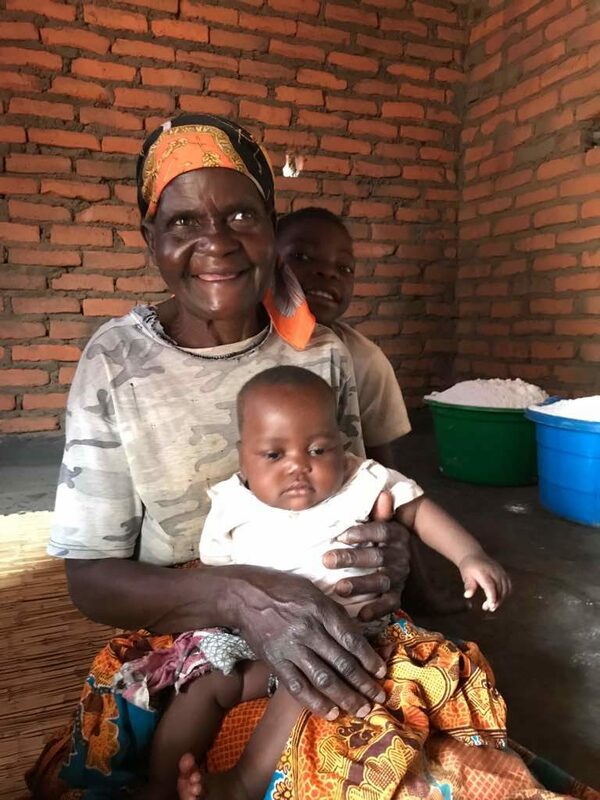 The hospital was far from her village home and so, like many Malawian women, when labor started she stayed in her village and delivered her baby girl at home. Unfortunately she began to bleed after delivering her daughter. Those with her were unable to stop the bleeding and there was no quick way to transport her to the hospital. Her life slipped away within minutes making her tiny 4lb daughter an orphan. Her relatives brought the baby to the health center seeking help and were referred to Joyful Motherhood. 17 year old Mphatso came to the health center on June 6th for her regular prenatal visit. This was her first pregnancy and she wanted to make sure her baby was growing well. While at the health center she fell to the floor and started seizing, that same day she was transferred to the referral hospital and a c-section was done. Her premature baby weighed only 4lbs. Nine days later she developed a distended abdomen and an exploratory laparotomy found a severe infection. At that time they did a total hysterectomy. On June 29th her wound was found to be severely infected. Finally on July 12th, still weak and on anti-hypertensive drugs, she was discharged home. These are a few of the difficult stories from July. The need is immense but with our combined compassion, hope, and resources we can support these women and families through their most difficult moments and see them through to the other side.